At my local farmer's market, there's a Community Table where people can sell what they make, or extra produce they have from their garden. 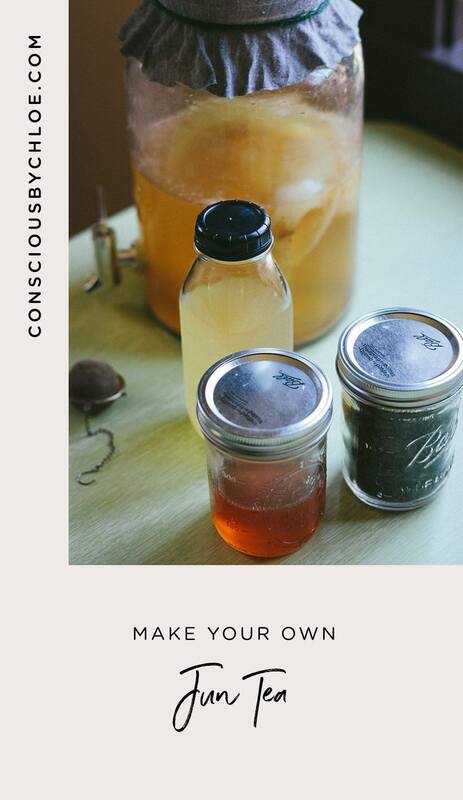 A couple weeks ago, I read on the market's Facebook page that Vera was hosting a kombucha workshop there and selling starters for a small donation. I had been hearing about kombucha for months, but never really knew what it was, so this was the perfect occasion to learn more. I went to the market, Vera explained to me the difference between kombucha and jun, I picked up a jun mother, Vera's recipe and went back home to start my own brew. Contrarily to kombucha, jun feeds on honey rather than sugar. It also thrives in green tea. These 2 characteristics led me to brew jun rather than kombucha. Apart from this, both fermented drinks seem to have beneficial properties due to their probiotic content. 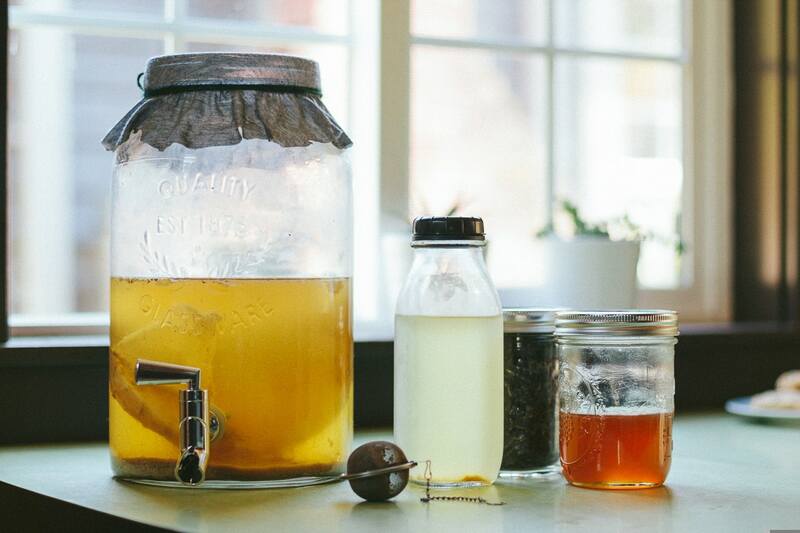 During my research, I stumbled upon continuous kombucha brewing recipes. As it looks like the mother, or SCOBY - which stands for Symbiotic Culture of friendly Bacteria and Yeast - does not like being handled too much, I thought it would be a great idea to adapt Vera's recipe to continuous brewing. But, let's be honest, I chose the continuous brewing option because it involved less hassle and less washing up! It is sometimes called the honey-based "champagne of kombucha". I love its tangy taste. I drink it instead of orange juice during the day or add a little water if I I brewed it too strong. Boil the water and let it sit for 5-7 minutes. Add the honey and stir until it is dissolved. Add the tea and let the mixture steep for at least 20 minutes. Strain it and let it cool (you may use metal utensils for these steps as you're not in contact with the SCOBY yet). Once the sweet tea is at room temperature, pour it in the beverage dispenser, add the starter tea (about 10%) and the culture starter. Cover the top of the dispenser with the cloth and secure it with your twine. Place your brew in a warm place with air flow, out of direct sun. Depending on the weather and the size of your vessel, the process can take 4 days to 2 weeks. If it's really warm, start testing around day 5. The more sour and tangy, the less sugar is left, which is considered healthier. 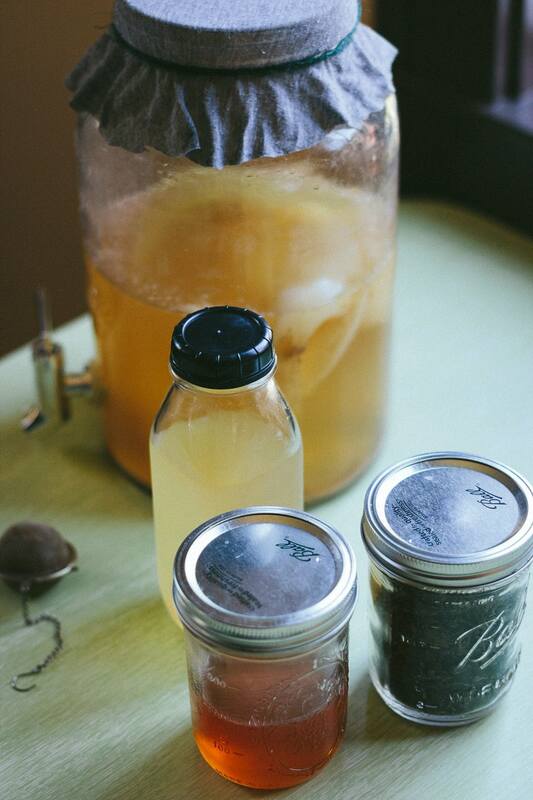 Once you've reached the desired flavor, open the spigot and fill glass bottles. Close them with plastic lids and store them in the fridge. Jun can store out of the refrigerator for some time, but it will continue to ferment. If you really want fizziness, you might want to do what's called a secondary fermentation once the flavor is to your liking. This is simple. Simply store the bottles closed out of the refrigerator for 3-7 days. This is also when you might want to add flavors such as herbs and spices. You may want to add juices and fruit purees after this period, as there is a tendency to get overly sour or carbonated. As soon as the level in your container is getting low, prepare more sweet tea and pour it into the dispenser once is at room temperature. After a few batches, a new SCOBY will form. It it gets too big, you can tear a piece off and give it to a friend with some starter juice so he/she can start his/her own brew. Try not to handle it with your hands too much, but a little doesn't seem to hurt and don't forget not to let any metal instrument be in contact with the SCOBY (like a pair of scissors or a knife). Be sure to keep the culture covered at all times and to keep and eye out for those pesky vinegar flies. Sometimes, there are color variations on the new SCOBY forming at the top. It's not mold unless it's a different color or gets fuzzy. If this happens, you need to sterilize and start over. Do not use metal instruments while handling the SCOBY. Jun is more forgiving than kombucha if it gets too sour. It might be too sour for a couple rounds but will return to the original flavor. And don't forget to head over to the Conscious by Chloé Shop to find all the equipment you'll need to make this recipe. Do you drink kombucha or jun? Do you brew your own? How is it going? Please share your brewer's tips in the comment section below!